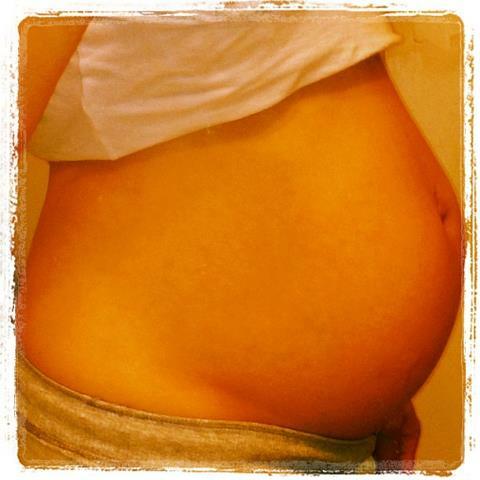 36 weeks & 6 days! Then it was off to the hospital for a NST test. Baby did wonderfully and actually moved around more than usual. Definitely a happy, active baby! After the test was complete, it was off to pick up Lil J from daycare and bring him to another hospital for an asthma evaluation. He's had persistent coughs after his last two colds, which is relatively normal, but given my history of asthma the doctors wanted to be on the safe side. Then it was off to Walmart where Lil J and I waited in the car and it took my hubby a good hour to find everything on the list. He did really well too and came out with a $140 grocery bill. Oooops! The good thing out of this bedrest fiasco is that my responsibilities have gone to zilch. And I'm loving it! I have a personal chauffeur, a chef, a housekeeper, a nanny, a maid and a husband - all in one!! Yup, I'm basking in my luck. I know I didn't really achieve "bedrest" on day 3 but it wasn't like I was moving around constantly. Hopefully my fluid levels are still on the mend.